69 year-old West Belfast man Ray Megahey is well known to anyone who frequented the Lámh Dhearg on a Sunday night. As part of the madcap duo Ray and Marty, Ray had regulars in stiches with his close to the bone comedy. Always joking and fun loving Ray now says it’s time to get serious as he wants to raise awareness of prostate cancer. Speaking to the Andersonstown News Ray said: “I have prostate cancer and it’s terminal, I’m speaking out in a bid to get men to go to their doctors to get themselves checked. “In October 2012 I went to my doctors for an MOT as I had turned 65, I asked if I could get tested for prostate cancer as my brother Anthony had died from it two years earlier. “That December I saw the oncologist at the City Hospital and after a rectal examination I was sent for biopsies. I didn’t receive any news for five weeks, which I took as good news, but then I got a letter to attend the oncologist in February, it was then that I got the dreaded news, eleven of the twelve biopsies were positive, I had prostate cancer. Although Ray was initially shell shocked he said he received great support from his Professor at the City Hospital. He said: “At that moment we were inconsolable but were told not to give up hope by professor Joe O’ Sullivan, he told us to go home and think about going on trials as they were testing new drugs. My first reaction was to say “I’m not going to be a guinea pig” but after a few days my daughter Lorraine put me in touch with a gentleman called Paul, he had been through everything that I was going through and it was incredible to hear him being so positive. He told me to go on the trials as it would mean I would be monitored every 4 weeks instead of 12 weeks, it’s the best phone call I ever made. “I had started to receive Zoladex (Gosereline Acetate implants a form of chemotherapy) which I got every 12 weeks so I agreed to go on the stampede trials which had several different arms to it, one of which was taking 4 Aberaterone tablets and 1 steroid tablet every morning which I was lucky to be assigned to. 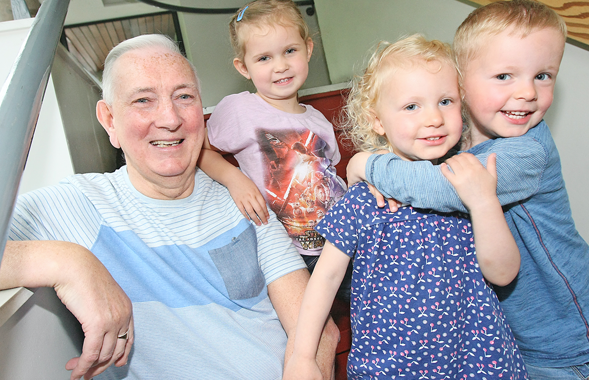 Ray says that by going through the trial process it has bought him precious time to spend with his beloved grandchildren. He said: “I go to my doctors every fourth Friday and get my bloods done then I go to the Bridge Water suite in the City Hospital where I get my results, thankfully they are always good. “The treatment does have side effects like hot flushes, night sweats and extreme tiredness as well as tingling sensations but considering the results it’s been well worth it. My first grand child Shannon was born not long after I started the treatment and I didn’t think I would see her grow, not only have I seen her thrive I now have two more grandchildren, twins Cillian and Orlaith I’m as happy as can be, I live for them, they are my reason to keep on going. “My professor said he couldn’t cure me as I have a terminal illness but that he will keep me alive as long as possible.